There has been a slight (two-day) delay in preparing the new Guiyang (East) part of the Shanghai-Kunming HSR, but it will still be opening in mid-June 2015 as planned. Official rail media are now confirming the opening for Thursday, 18 June 2015. The new part to be opened will be the six-station segment from Xinhuang West (新晃西; Xinhuangxi) to Guiyang North (贵阳北; Guiyangbei). Part of the Shanghai-Kunming HSR, the 286 km (179 mi) segment is good for speeds up to 300 km/h (186 mph) upon opening. Travel times form Guiyang to Changsha are now “just” 3 hours and 20 minutes insead of a previous 12 hours. This will be the second HSR line for the province of Guizhou. Trains to destinations outside of the new line, originally planned for mid-June 2015, have for the time being been pushed back to July 2015. There will only be 12 new trains running on the line for the first 12 days. These include six eastbound trains to Guiyang North, and six eastbound trains to Changsha South (Changsha’nan). 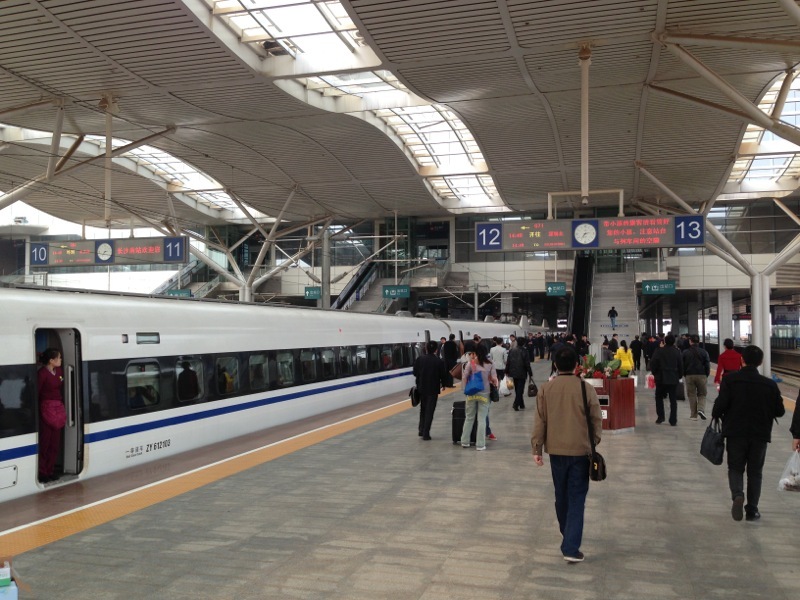 Passengers can change at both termini for trains on the Beijing-Guangzhou and Guizhou-Guangzhou HSR lines, and at Changsha South for the rest of the Shanghai-Kunming HSR line. Passengers can also change onto Changsha Metro Line 2 at Changsha South for central Changsha. Unfortunately, those travelling on Train G3012 might not be able to make it onto the last city-bound Metro train at Changsha South, so passengers might wish to book the G3010 train that leaves about two hours earlier. Tickets are now available, both online and at ticket offices, for the new services. Please note that there might be slight changes to the above schedule, especially as this is a new part of a line. Always check details at the booking office and at stations before you set off. Disclaimer: Best efforts have been made in manually inputting the above schedules. In any case, however, you are advised to check with official rail schedules, especially those at stations, as this site unfortunately cannot be held responsible for any problems resulting from the sole use of the above information.